To open the Summary report page, click on the Reports button in the main Toggl sidebar. 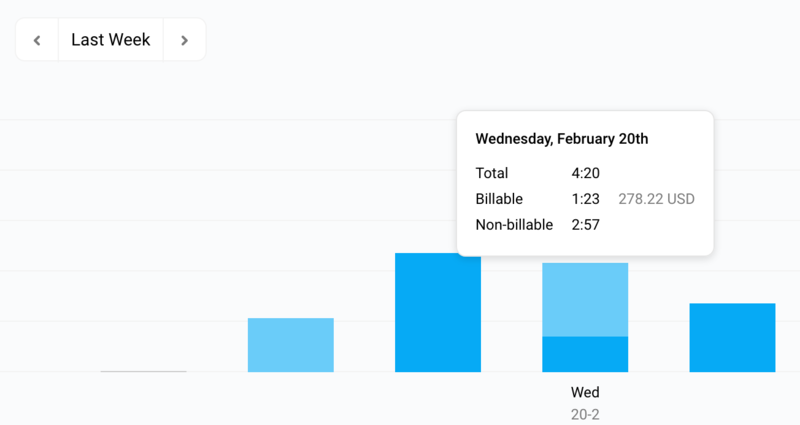 Use the Summary Report to see the total tracked time broken down in different ways. A common question answered by this report is "How much time did we track for a specific activity?" If nothing shows up on the summary Report when you first load it, you may need to define a date range for the report. Click on This Week on the upper-left, below Filter by. See the Selecting a date range article for more details on using the Calendar, especially for selecting custom date ranges. Please note that our reports have a maximum range of 1 year. To limit the report by to a specific User, Client, Project, and so on, use the options beside Filter by near the top. Clicking on a filter opens a dropdown. You can use the search box on the top of each dropdown to zero in on specific items as needed. The report updates automatically when you close a filter dropdown. More details are available through the Filtering reports article. Below the Filters and Calendar is a bar chart. This breaks down the tracked time by periods, depending on how long the report's date range is. On paid Workspaces, the dark blue portion of each bar indicates how much billable time was tracked for that period. You can hover over each bar with your mouse pointer to see the the total time for its period. Underneath the bar chart is a two-level breakdown of the time, set through the Group by + and dropdowns. The list below these dropdowns automatically update as you make changes. Clicking each number beside each first-level item shows the second-level items under it. For example: With Client and Time Entry set, you'll see the different Time Entries tracked for a specific Client. To the right of the list are the total Clocked Hours for the report. 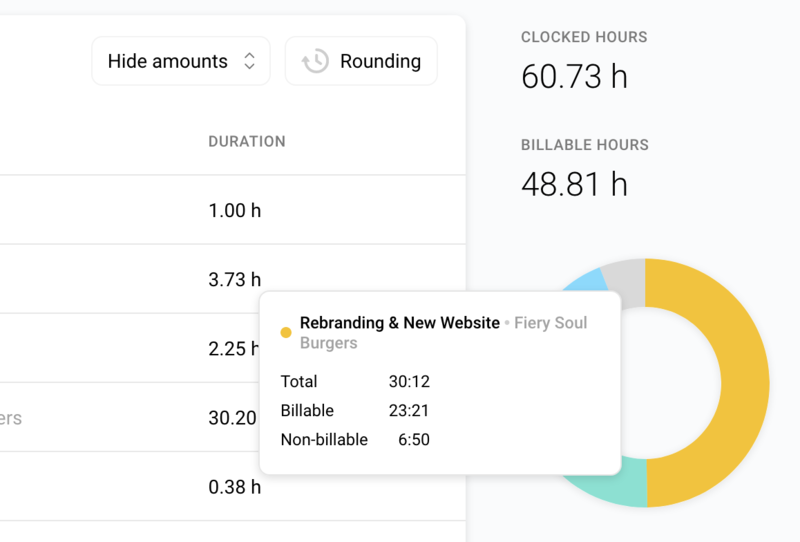 On paid Workspaces, the total Billable Hours and Amount are shown as well. Also on the right of the Grouping List is a donut chart that visualizes the list's first-level breakdown. This chart only shows items that represents the majority of the tracked time — everything else is automatically put together into an Other slice. Hover your mouse over each slice to see more details for it. Click on the download icon on the upper-right to download the report as a PDF or CSV. On paid Workspaces, you can also download the report in Excel format, and click on the disk icon to generate a Saved Report.